Details Rublev Colours German Vine Black is obtained from the calcination of grape vine shoots, which results in pure carbon with quantities of potassium and sodium salts. The pigment has a bluish black hue and tints made with white have a bluish tinge. Vine black does not have the tinting strength of lampblack, but it has excellent lightfastness. Vine black was known since prehistoric times and used extensively by medieval and Renaissance artists. The term 'vine black' may refer to a char of woody material from vines, but has been historically applied to chars and cokes of a wide range of other materials, such as yeasts, and as Mayer (1983) puts it, 'various second-rate materials of vegetable, animal and petroleum origins.' Tingry (1804), however, states that this does in fact from burnt vine twigs. Vine black is produced by charring dried grape vines and stems, which results in pure carbon (chemical formula of charcoal black is C) with small quantities of potassium and sodium salts. The one year old and barely lignified shoots pruned systematically from vines each year are used for the preparation of the black pigment. The dried shoots are packed, cut in equal lengths, into iron pipes, which are crammed as full as possible. A plug is then put in the pipe, which is slowly heated to red heat. The charred matter contains considerable quantities of potassium carbonate from the organic salts originally present, which are removed by washing with water. Washing with water and grinding usually constitutes the entire preparation of the pigment. Soft shoots of other plants can also be carbonized to give a product that can be used as a black pigment. Shoots of porous white wood, such as poplar, alder and willow, are especially suitable for this purpose. 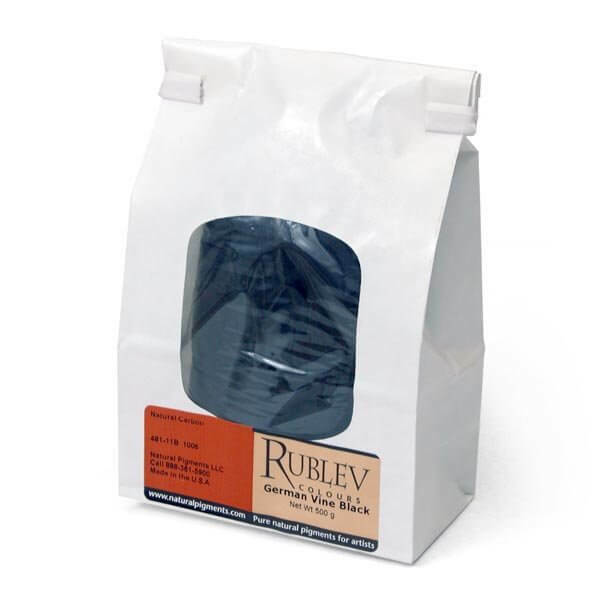 Rublev Colours vine black comes from Germany where it is prepared in the traditional manner from vine shoots. When the charcoal has been calcined at a sufficiently high temperature and then thoroughly washed, there is no question as to its permanence as a pigment in all media. However, if it has been imperfectly carbonized, then it may become grey after long exposure to light. This change is due to the oxidation of the volatile constituents, brown substances that are intermediate in composition between the original vegetable matter and carbon. A peculiar property, possessed in varying degrees by charcoal of every kind, must not be ignored when mixing carbon black with other pigments. Charcoal adsorbs organic coloring matter from its surrounding medium. If you add a small amount of charcoal black to a pale tint of rose madder in water, it rapidly decolorizes, the pigment being adsorbed, although not destroyed. Animal charcoal (bone black) is more active in this quality and lamp black less powerful. Vine black absorbs a moderate amount of linseed oil; 30 grams of oil are needed to form a paste with 100 grams of pigment. It grinds easily in both drying oils and water. Carbon blacks have been known to be poor driers in oil paint for centuries, but the cause was believed to be due to the presence of oily impurities. 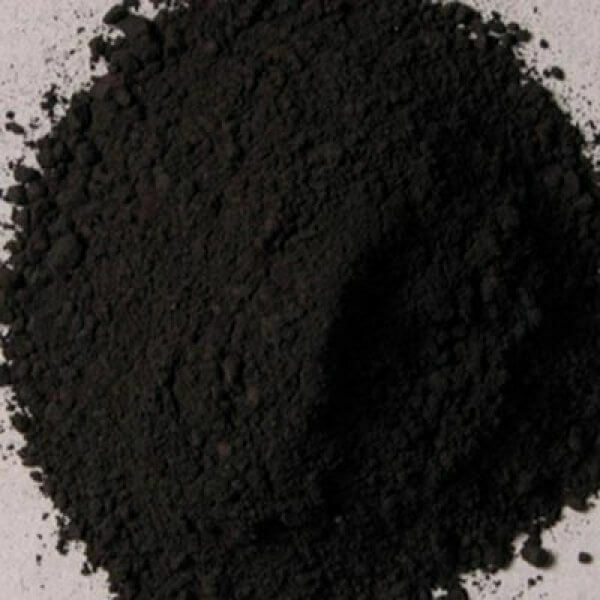 It was later found that carbon black pigments inhibit the oxidation of drying oils due largely to the adsorption on the pigment of intermediate oxidation products, which are the true catalyst in the drying of the oil (Rhodes, 1926). When added to drying oil containing a drier, carbon pigments adsorb some of the drier and for this reason also tend to retard drying. Vine black, as is most carbon black pigments, is not considered to be toxic but care should be used in handling the dry powder pigment so as not to inhale the dust.